Dawn comes late this morning and even as it finally struggles to light the sky I still have a lantern burning and I write by the glow of my computer screen. How incongruous that sounds! I will have to live with the contrast for even if I resist technology and “progress” I am so grateful for my laptop! The sky is grey and damp in contrast to the arid dryness we have learned to adjust to. Just yesterday I marveled at the warmth of the day and the duration of the drought and mused that old man winter may have spent himself last year in all of his fury. So he rises this morning, scratching his beard and grumbling as the wind comes in from the east and he flings the clouds across the sky while hoping he has the strength to make it storm. I have my doubts; it is too dry for all that and as with the summer rains it may never reach the ground. Still, the contrast is wonderful for one who has seen clear sky for weeks on end and the clouds are a joy in themselves. Speaking of joy, what of yesterday when dawn outdid herself and spread her colors from east to west, drawing me out to the porch and then to the hills, rushing to don my boots and grab my pack and water as I headed for the mountainside to join the breaking day. My direction was clear and I headed for the Vera Cruz Mine which sits far up the mountain and in view of my window where I write each day. I have been close to the structures only once when having scaled the steep slopes to reach its perch my approach stalled me as I reached the loose slag on the eastern face of the mountainside. The crumbled rock tailings posed too great a danger for me to continue as I contemplated the fall from the narrow path above them and the depth of the canyon below where nobody might ever find my tattered remains. As I had already exhausted myself with the climb I decided to turn back before I reached the prize. That was years ago. Since then I have yearned to make the climb but have never made the effort to do so. I took a different path this time and followed the elk herd up the slopes from the western edge while planning only to reach the mine and watch the beauty of the breaking day from that vantage point. In spite of older bulls having been hunted hard these last few weeks the herd stood still and watched me for a long time, the group being composed of slick fat cows and one young bull, unworried by my presence but finally giving way to caution. They moved off slowly only to be found again on the next slope. Up I climbed, taking the gradual incline as the elk did, their trails always being the wisest choice when approaching any mountain. The climb went easily with my legs being strong from a week of traversing the dunes at White Sands and I marveled at the old mine shafts, pausing briefly to study and photograph them as I neared the prize with the mother lode and her crumbling structures finally within my reach. Funny, once I was there it wasn’t enough. The towering summit of the Vera Cruz Peak called to me, looming another 1000 feet above me, or more? Her steep slopes are awesome and forbidding but the thought occurred to me that I might never again have the chance to conquer her and I could not resist the challenge. I checked my phone for a signal and called my son David, who lives with his wife and children in the valley just below my perch. I perused the risk and told him where I was and what I planned to do. I am sure he was smiling even as he cautioned me to be careful, he knows me well! Up I went, surprising myself with my strength, pausing to catch my breath and moving on again, reaching the crest only to look higher to the peak, twice deceived by the greater distances but not discouraged. As I climbed even higher the view stretched further and further until I could see the Capitan Mountains and then even the Capitan Gap came into view. There sat our old home, the Hammett Ranch and all its memories. Within a few steps of that vista I found a survey stake, its tape faded but the cap still legible and stamped ‘Tim Collins and Associates’. Perhaps Ronnie Hammett himself pounded that marker in when he was working for Tim and even though I will never have the chance to ask him I felt his presence as if he were standing beside me. His death closed so many doors and yet he appeared there all the same, he who I hiked so many mountains with all those years ago. I found no coincidence in the event, it seems as if he is always nearby at such joyous moments and his memory will never fade! I followed the elk trails all the way up the mountain and marveled at their efforts in the places where I struggled to climb. They make the journey on four legs and weigh far more than I do and always appear to be off balance to me with their heads set high on their back turned necks. What would bring them here, so high above the grass covered flats but for the safety of the peaks and the profusion of the oak brush? The grass grows thin on the parched rocky slopes and the wind howls there as it does no place else. I imagine this place must be the source of the wind as it never seems to cease and its song always resonates in the crevices and canyons that separate the mountains below, a phenomenon I have always deeply treasured. I marveled at its strength as I climbed towards its origin, buffeted by its fury after leaving the stillness down below. Now I could see into the canyons which I had always wondered about as they lay just out of sight over the crest of the neighboring mountain and my eye followed them down across the valley. I studied the smooth surface of the plains beyond them which are carved apart by the deep arroyos that carry the runoff from the rains, when and if they come. The narrow crevices were all deepened by the floods of 2008 but have been dry ever since. My son’s house came into view as well, miniscule in comparison to the breath of the valley below me and providing a welcome perspective of the height I had reached. Further to the west I could see the Town of Carrizozo and the winding railroad tracks heading north and south and could better appreciate the distance which the trains rumble travels before reverberating off of the mountainside. It is clearly audible from my house in spite of the ten miles which separate it from where I live as there are no obstructions to dampen the sound. Its whistle even carries over the distance on a given day. 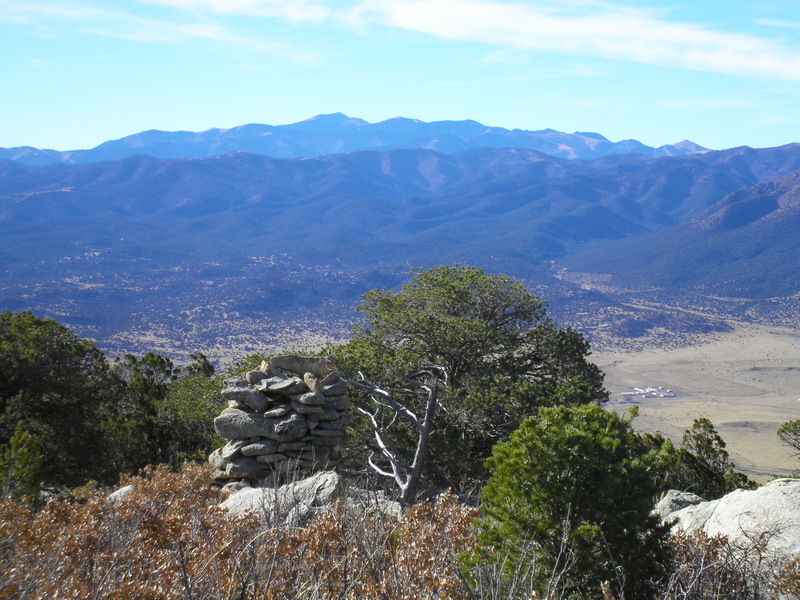 Off to the east I could see the village of Capitan and to the south the towns of Alto and Ruidoso. Climbing even higher I could finally see from the peak to the long sweep of the Carrizo Mountain to the northwest, blocking the view further to the north but with all the rest of Lincoln County within my sight. The Vera Cruz Mountain; I reached the summit and on the highest point discovered a monument of rocks which had been built there many years ago. They were moss covered which revealed their age and some had fallen with the passage of the years. I picked a few back up, the ones that I could lift, as they were large and heavy. I added a couple more as well but all the others were firmly rooted in the ground and the top of the shrine towered above the reach of my arms. Such men these must have been who ventured here years ago, their powerful arms placing these rocks upon each other to remain there forever after as a marker of their presence! I stood on the crest of the mountain and then walked its level peak to access all the points of interest while marveling at the height and the reach of my view but I didn’t linger long. Perhaps the thrill of my accomplishment erased my need for contemplation but even more so the tremble in my legs and the howl of the wind prodded me to go. The winds had become incessant in spite of the stillness of the dawn and I had been climbing for three hours! Still, the absolute thrill of the accomplishment and the broad vista that was offered to me was enough to make me giddy and I rejoiced in the heady feeling of my adventure. In retrospect I might have sat for an hour at least but instead I headed back down, picking my way with caution as the slope was even steeper on the decline and heading off the east side I found myself continually battling the wind. Throughout my descent the wind was unmerciful, almost as if to say I trod on sacred ground and wasn’t welcome there though I felt no trepidation except for my own safety on the descent, knowing it would be treacherous. These mountain peaks are the haunt of the elk, deer, antelope, coyote and mountain lion and are now the only place they are safe from the continual onslaught of humanity. None of them would harass me if we met on the trail as they would rather flee than confront a human, unless cornered beyond escape. The older spirits lingered there also as many an Indian must have sighted from those heights for hundreds if not thousands of years and if their spirits have followed me through the canyons at dusk so they lingered with me now. I could sense their presence stronger than the living ones whose trail I was following, likely the same ones these people had traversed during the time they reigned here. I have found their sign as clearly as the tracks I followed in the dust, petro glyphs carved in the rocks as well as chips of rock and the tools they carved from them. They are as sacred as the distant reaches of these canyons I have ventured into. The wilderness of the mountains beyond my dwelling is their haunt and not mine yet they drew me there as well. For all the years I have lived at the foot of the mountain I have yearned to climb her summit, the pull coming from deep within my spirit and it is the same energy which pulls me off into the canyons on a routine basis, it is a draw I have never been able to resist. This day it was the dawn herself which beckoned me forth, it was my day to come there, my first and so likely my last! I was cautious and aware that I was vulnerable as well. Although I saw no cats I noted plenty of their sign. As I crossed a narrow draw I kicked up a fat buck and a doe out of the canyon. The doe was curious and even took pause to observe me but was quickly prodded away by the buck’s sharp horns in her rump, his dominance and caution made clear as they moved off across the mountainside. My knees ached as I walked sideways down the hill, falling softly more than once when the loose rocks gave way; the words “Careful, careful!” echoing in my brain for this was rough stuff and one slip or fall could have been the end of me, or worse. I had to pick my way carefully between the rocky outcrops which were covered with the prickly pear and cholla cactus which flourish along the steep decline of the slope, capturing whatever moisture occasions to flow down their smoothed face. If going up was a challenge so climbing down was worse, handholds are few on the descent. The wind tore at me constantly and threatened to push me off each ledge and send me tumbling into the canyon, unrelenting in its onslaught as it drove me down the mountainside. It took me another three hours to make the journey back but I made it down safely, tired but overjoyed at my accomplishment. Once I was off the steep slope I paused to look back and marveled at the thrill once more while feeling as if I now had some ownership of the mountain for having stood and walked upon it, I had summited its peak! The wind still howled and buffeted me even after I found the gentler slope, angered perhaps by my trespass and strengthened by the coming storm as the clouds began gather, seeded by my foreign presence. As I followed the narrow trails I soon found familiar landmarks and places I had walked before. They brought all the more wonder to my climb as I measured the distance to the crest and thought of the people who had been there before me; what a tough lot they were! We had all conquered the mountain in our time and yet it still loomed above us, the challenge undiminished by our conquest. I now sit at my desk and listen to the wind which even now, a day later, has yet to cease. I look up at the Vera Cruz Peak and mark the mine sight which before now had always posed a challenge to me. Then I look up to the crest of the mountain and marvel at how just yesterday I stood there. The wonder of the adventure will never desert me!